After traveling about five miles down a concrete-lined channel, the Los Angeles River turns back into a normal river for two miles through Woodley and Balboa Parks. 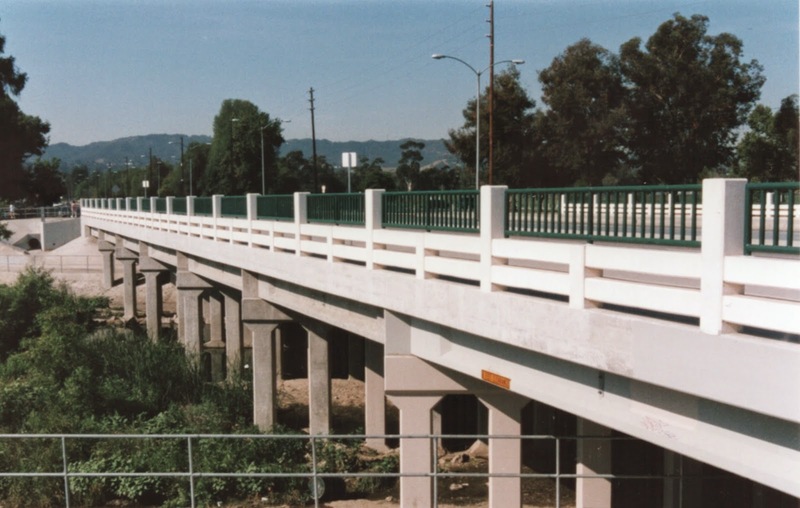 The Balboa Blvd Bridges (53C1095 and 53C1096) are two parallel seven span structures; one with steel girders built in 1941 and one with concrete girders built in 1964. Both bridges were widened in 1996 with sidewalks on both sides. The bridges have pretty columns and barrier rails. Los Angeles County, California Bridges: Balboa Boulevard Bridges across the Los Angeles River by Mark Yashinsky is licensed under a Creative Commons Attribution-NonCommercial-NoDerivatives 4.0 International License.